Lisa Lee, third from left, poses with her DCJS colleagues after receiving the State Academy for Public Administration 2017 Public Service Excellence Award (from left to right): Joshua Vinehout, Todd Murray, Johanna Sullivan and Michael C. Green, commissioner of the agency. Lisa Lee works quietly behind the scenes to hold irresponsible drivers accountable. As technical supervisor overseeing the Highway Safety Equipment Unit at the state Division of Criminal Justice Services, Lee plays an integral role in ensuring that more than 7,000 breath alcohol measurement and speed enforcement devices used by police agencies across the state are properly functioning. The veteran of 34-plus years of service at DCJS, who retires next month, also has been instrumental in securing grants from the Governor’s Traffic Safety Committee so that law enforcement professionals are better trained and better equipped to crack down on drunk or aggressive drivers. In recognition of her service, Lee received the New York State Academy for Public Administration’s 2017 Public Service Excellence Award, a designation given annually to those who contribute to the overall enhancement of public administration or policy. 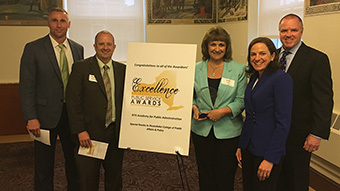 The organization presented her with the award at a ceremony on Monday, May 22, at the Rockefeller College of Public Affairs and Policy in Albany. Lee, of Clifton Park, Saratoga County, is the first Division of Criminal Justice Services employee to receive the award, which was first given in 2012. 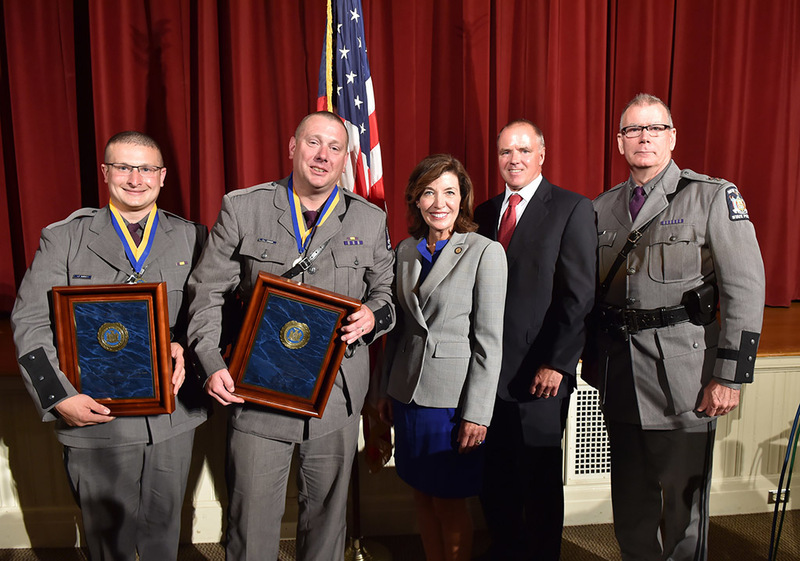 Also honored with awards this year were Anthony Giardina of the state Department of State’s Athletic Commission, Andrew D. Morris of the state Department of Taxation and Finance and the Albany County Opioid Task Force. DCJS Executive Deputy Commissioner Michael C. Green and Johanna Sullivan, director of the agency’s Office of Public Safety, nominated Lee for the award. The nomination outlined Lee’s achievements, including streamlining services for agencies that rely on her unit for support, initiating a project allowing these agencies to test breath instruments remotely and providing district attorneys’ offices with equipment testing records they’ve used to successfully prosecute cases. Lee initiated a project to automate and digitize the documentation of speed and DWI detection equipment testing. Previously, the unit needed to manually generate more than 6,800 documents annually and then mail them to prosecutors. A member of the state DWI Advisory Council, Lee helped develop a standardized supporting deposition and initial contact forms, which are now used statewide strengthen DWI investigations. She also has worked to develop policies that help to support holding establishments that over-serve patrons accountable and in 2002, initiated a program that allows police to gather information on last drinking location of individuals suspected of drunk driving. This details are collected and compiled by DCJS, which shares them quarterly with police, STOP DWI coordinators and the state Liquor Authority for follow-up investigation and enforcement. Lee also partnered with colleagues from the DCJS Office of Probation and Correctional Alternatives in 2016 to develop an ignition interlock device refresher training and enforcement pilot program. Three counties participated in the program last year, which led to the arrest of 66 individuals, including 29 motorists who were charged with failing to comply with a court-ordered ignition interlock device. Law enforcement in three additional counties were trained earlier this month and enforcement will occur between Memorial Day and Labor Day. The State Academy for Public Administration engages the energy and expertise of its members to improve public service; foster commitment to the highest professional standards of performance, integrity, and knowledge; and create a positive perception of public service and the profession of public administration in New York State.